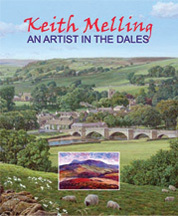 Keith Melling is one of England’s leading landscape painters. 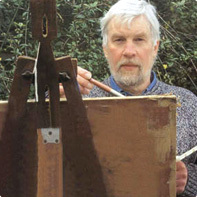 Born in 1946, he has been drawing and painting for as long as he can remember. His first exhibition of 40 paintings was in 1966. 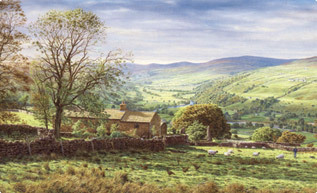 Although making use of a wide variety of mediums and techniques, oil paint made by himself in the traditional way, is still a favourite. There is an ever increasing demand for his fine quality prints, published from paintings produced over the last 39 years. He is represented in collections throughout the world. The K Melling Studio-Gallery in Fence near Burnley displays a full range of over 100 framed prints plus greetings cards and post cards. This book is brand new and signed by the Author. Beautifully situated by a tranquil stretch of the River Wharfe, Burnsall is one of the most visited villages in Wharfedale and perhaps in the Yorkshire Dales. 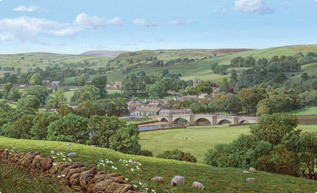 This painting shows Burnsall in its lovely setting from a vantage point on the Bolton Abbey road. Looking down Goat Scar Lane to the typical Yorkshire Dales village of Stainforth, Smearsett Scar is prominent in the background with Ingleborough on the far distant right. In the heart of Swaledale, this Yorkshire Dales village holds a commanding position at the foot of Kisdon Hill. 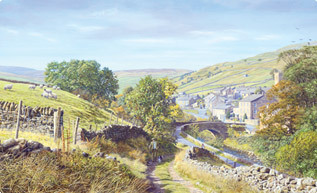 The view in this painting is from the track across Straw Beck which flows into the River Swale nearby. 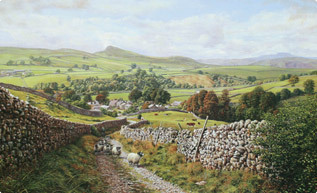 Looking up the dale towards Gunnerside, the viewpoint is by Birks House on the easterly moor road to Wensleydale. Swaledale is perhaps the most dramatic of the Yorkshire Dales because of its narrowness. The River Swale is one of the fastest flowing rivers in England.